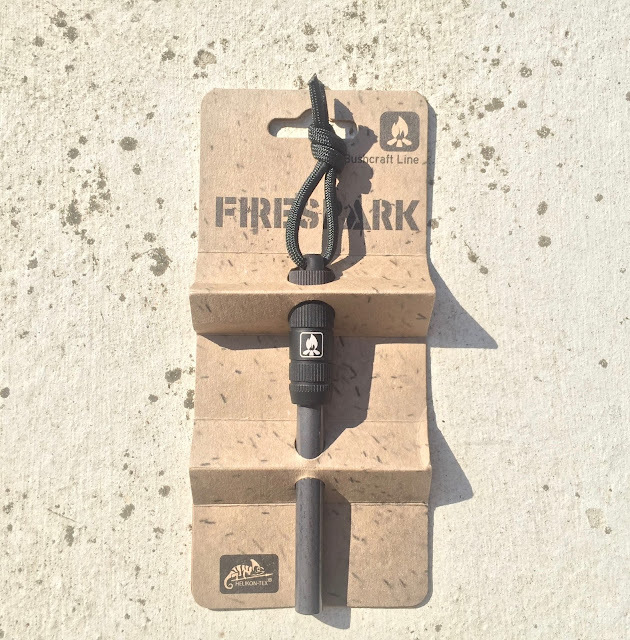 I do like a ferro rod; if I didn't keep losing them I would say that they provide a lifetime of sparks, and of course give you a nice bushcrafty feeling when you spark your fire or stove to life with it. Ferrocerium rods 'can' knock out sparks of up to 3,000c, where they're not all born equal is the size of the burning flakes of metal we see as sparks. More than one of the famous outdoor brands, endorsed by celebrities who should know better, produce rather pathetic little dots of spark. I've had a few over the years: from an awesome one made in some dude's shed that produced its own weld-splatter, to the really rather pathetic one made by the famous Swedish brand. This one came from Poland, and as usual with Helikon: heroes of Polish Bushcraft was a bit cheaper than the others and it turns out a bit more thoughtfully designed. Size-wise its probably overkill, being about twice the thickness of the well known brand, it's going to last several lifetimes. I was a bit unsure about the smaller handle to start with, but once I realised it unscrews to give you a place to stash some vaseline soaked cotton wool or a splodge of Bushcraft Napalm I was a believer. Fire steels are awesome ,especialy if you've got flammable kindling to catch the spark. At some point I'm going to make a sheath for my Fallkniven F1 with a loop for the Firespark. Overly robust knife and bike axle ferro rod make a nice pair. The tinder/ napalm holder really makes it. Handy bit of kit. Would buy again.